Android is based on Linux. On Linux and other UNIX-like operating systems, the root user is equivalent to the Administrator user on Windows. The root user has access to the entire operating system and can do anything. By default, you don’t have root access to your own Android device, and certain apps won’t function without root access. Rooting is often a simple and quick process. However, there’s no single standard way to root every device. We’ll cover a few useful tools that will root a large majority of devices here. If your device isn’t supported, check out the XDA Developers forum and look at the subforum for your specific model of device. This is a good place to start finding out how other people have rooted your device. Thankfully, there are some tools that make this process easy for the vast majority of Android phone and tablets out there. If one of these tools doesn’t work, you can likely find instructions specific to your individual device online. You’ll just have to do some searching. Bear in mind that you’ll need a root process that works on your device and its current version of the Android operating system. Rooting instructions for older versions of Android on that specific device may not work. 1. Kingroot is an amazing tool for “lazy people” who just want to get root access but don’t want to flash any third party Recovery into their lovely device. It is one of the most famous root tool in China and now we release English version here for everyone, totally free and without AD. 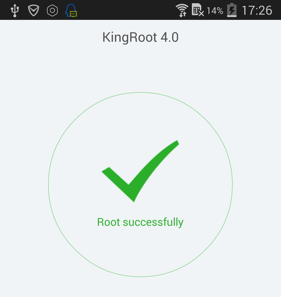 Something interesting will happen when you root your device by KingRoot, the most suitable Root strategy will be deployed from cloud, that is why we have higher success rate that some other tools. Specifically, root success rate will higher than 60% on supported device. 2. 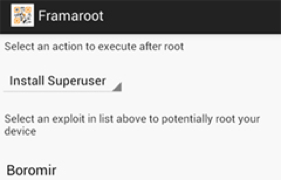 Kingo Root is a simple, easy way to root a large amount of Android devices. Here’s an incomplete list of the devices Kingo Root supports. This is a Windows desktop app, so you’ll need to download Kingo Root and run it on your Windows PC. It will try to automatically root your phone or tablet using a variety of techniques. Before connecting your Android phone or tablet to your computer via a USB cable, be sure to enable USB debugging. 4. Towelroot is another option you might want to try. Enable apps from “Unknown sources” under Settings > Security, download the Towelroot app, and install it. Android will warn you that this app will attempt to bypass Android’s security settings — that’s the whole point. Bypass the warning and install it anyway. 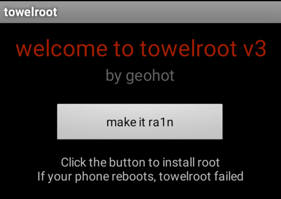 Towelroot was developed by GeoHot, a well-known hacker in the iPhone jailbreaking community. You then open the installed app and it uses an exploit in Android to root your device. Towelroot should support every Android phone or tablet with a kernel build date before June 3, 2014. 5. Framaroot Here an one-click application to install Superuser and su binary on phone.Look at the compatibility list. Superuser and su binary include in application work from android 2 to 4.This app including several exploits named as the heroes of the book “The Lord of the Rings” Gandalf, Boromir, Pippin, Legolas, Sam, Frodo, Aragorn and Gimli. You can install Superuser and su binary on phone or tablet from android version 2.x to 4.x. All compatible devices can be found here. Unroot also very simple, just use this option in framaroot application.